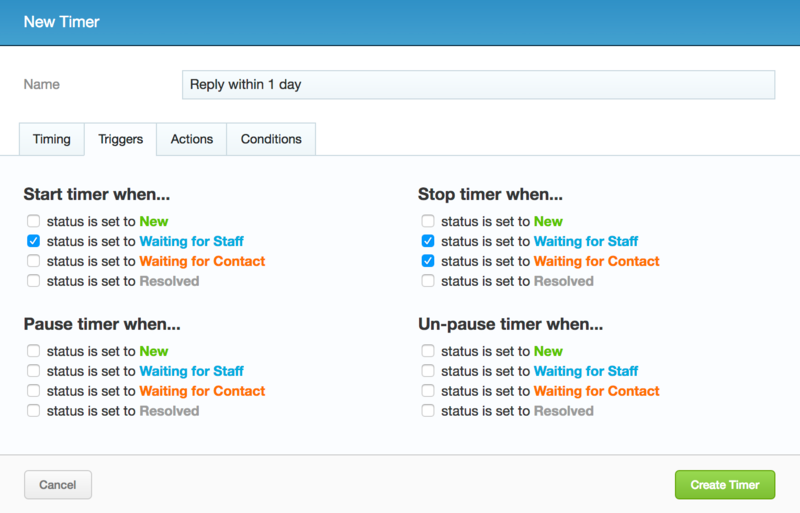 Sirportly has a powerful timer system that you can use for a wide variety of applications in your helpdesk. Today we're going to look at setting up a simple timer to remind an assigned helpdesk user if they've not replied to a customer within a day. To start, head to your Admin interface, then to Workflow -> Timers, clicking Add new Timer to start. You'll be presented with 4 tabs in the dialog, which we'll outline below. In Timing, we should set the schedule for when this timer should be run, and its total duration. We'll select Working Hours, a schedule that only runs during our working day from 9am-5pm, Monday to Friday, then 480 minutes, or 8 hours. This ensures we're not alerting staff unnecessarily if they haven't replied during the weekend, or in the evenings. Next in the Triggers tab we need to select to start the timer when the Status is set to "Waiting for Staff", and Stop it when it's either set to Waiting for Contact, or Resolved. As a result, the timer will only run when the ticket is waiting for a reply from a staff member. In Actions we'll select the option to alert the assigned user, but we can also set a number of options via the additional Add Actions dialog, which presents the same powerful options as you'd find when configuring a Macro. 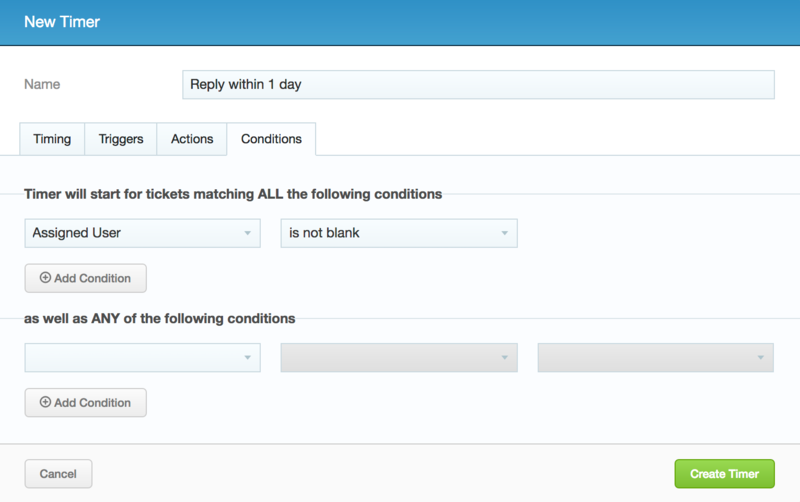 This action triggers an email alert to be sent to the staff member, informing them that the ticket needs to be responded to. Finally, we'll set the condition Assigned User is not blank. This will ensure this timer only operates when there is an assigned user on the ticket by selecting the appropriate condition. Now we've created our timer, Sirportly will alert any users who haven't responded to a ticket within 1 day, but with the added bonus of only alerting them based on our working hours and not weekends or evenings. We hope you've found this post useful, there are many even more powerful applications for Sirportly timers and you can find out more information in our documentation. If you have any questions about Timers or any other aspect of Sirportly, please don't hesitate to get in touch.